I’m sure someone somewhere in the world has made pumpkin pie flavored sugar, but I haven’t seen it so I claim it as my own! The sugar is mixed with ground cinnamon, nutmeg, cloves, ginger and allspice to give that signature holiday flavor. You can use it in your holiday baking, or stir it into hot wine for a delicious holiday cocktail. My absolute favorite way to use it though is in my pumpkin pie creme brulee. You can see it peeking out of the top corner of the photo. That recipe’s coming next, I promise! The recipe below is simple. 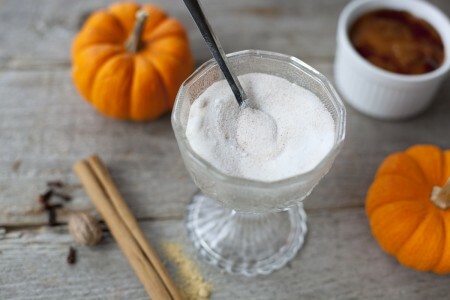 I always make my own pumpkin pie spice because I have all the ingredients at home. To make it inexpensive, get your spices from the bulk jars that many grocery stores have. In our area, Top Foods, Fred Meyers and WinCo all carry bulk spices. It ends up costing so much less than buying the bottled spices. This is my last flavored sugar for the week. We’ve had orange sugar, vanilla sugar, and pumpkin pie sugar. Do you have another favorite? Maybe lemon and lime sugar, or cinnamon sugar? Or something I haven’t even thought of? I’d love to know! Mix all the ingredients well and store in an airtight container. Easy as pie! Approximate cost/serving: This only cost me 83 cents for two cups!